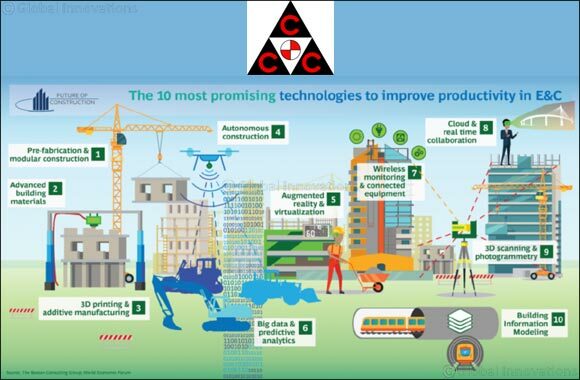 Dubai, United Arab Emirates - July 5th, 2018 - Full-scale digitization of the construction industry – including 3D printing, AR and even autonomous construction – could save up to $1.7 trillion globally within 10 years, a new World Economic Forum report shows. The report, Shaping the Future of Construction: Future Scenarios and Implications, is the first ever to integrate consideration of new technologies and trends into three consistent scenarios for the future of the global engineering and construction industry. Consolidated Contractors Company, a leading global construction company, worked closely with the World Economic Forum and Boston Consulting Group to serve on the initiative and contribute to the report, which comes as a result of a year-long collaboration with more than 30 leading companies in the engineering and construction industry. The report highlights that new digital technologies, such as building information modelling (BIM), 3D printing, wireless sensors and autonomous equipment are disrupting a range of industries, including the Infrastructure and Urban Development (IU) industry, and that stakeholders can no longer afford to ignore these fundamental changes. The Member of the Steering Committee for the Future of Construction Initiative, Consolidated Contractors Company Manager M.I.S. & Business Processes Re-engineering, Aref Boualwan, said that these digital technology megatrends were crucial for the industry to meet global needs in the future. “The three futuristic scenarios we identified in the report are extreme, but conceivable – they analyze how multiple current megatrends could establish different versions of a future world. The scenarios – ‘Building in a virtual world’, ‘Factories run the world’ and ‘A green reboot’ are not designed to predict the future – but to help us prepare for emerging trends”, Mr. Boualwan commented. According to the CCC executive, there is little doubt that a realistic version of our future will include elements of all three scenarios identified in the report. “When it comes to technology specifically - the ‘building in a virtual world’ scenario sees an era where people are immersed in virtual reality in all aspects of life”. In a global context, this scenario sees major advancements in robotics and artificial intelligence - automation, connected systems and cloud technology permeate daily life and industries of all kinds. “Elements of this scenario are considered very likely – we predict new businesses will emerge, software players will gain more power and more residential, recreational and passenger mobility assets will be required”, Mr. Boualwan stated. “As a result - transformation imperatives are crucial for all parties in the construction industry, to help them adapt to new realities. We must capture new opportunities and adopt advanced technologies at scale – including initiatives like wireless equipment, cloud & real-time collaboration, 3D scanning/printing and augmented reality and visualization. We have seen digital technologies completely transform global industries in recent years – from social media to e-commerce and digital based mobility companies. But only very recently have digital technologies begun to emerge in the engineering and construction industry. This is the way of the future – and this report will help companies across the industry adequately prepare for it,” he continued. The scope of the initiative is to prepare for a challenging but promising future, while securing and enhancing the wellbeing and happiness of society. The IU industry should, therefore, react quickly and with appropriate action to changing conditions and opportunities for new business to provide societies globally with sustainable, affordable assets that fulfil human needs.